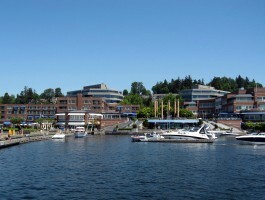 Kirkland is located 10 miles east of Seattle in the Eastside community of cities. Kirkland is often described as the Eastside's most romantic town, as its location on Lake Washington affords dramatic views of sunsets, the Seattle skyline and the Olympic Mountains. Marina Park is part of the downtown and provides a sandy beach, public marina and tour dock. During July and August, enjoy Music in the Park concert series, and during the holidays, Marina Park is the focus for the Holiday Christmas Ship tours and parade. Downtown is a mix of upscale art galleries, boutiques and an eclectic mix of great restaurants. Quaint outdoor cafes provide relaxed dining and plenty of people-watching opportunities. Short walks from the downtown include heading south on Lake Washington Boulevard past downtown parks, mansions and multimillion-dollar condominiums. At 1.2 miles, arrive at Carillon Point, rich in Kirkland history and home to a four-star hotel and great restaurants. A second stroll 1.3 miles north of the downtown area takes you through the historic homes of Kirkland, great views, and statues culminating at the unique 144-acre urban wildlife preserve which also provides historic markers of the area.